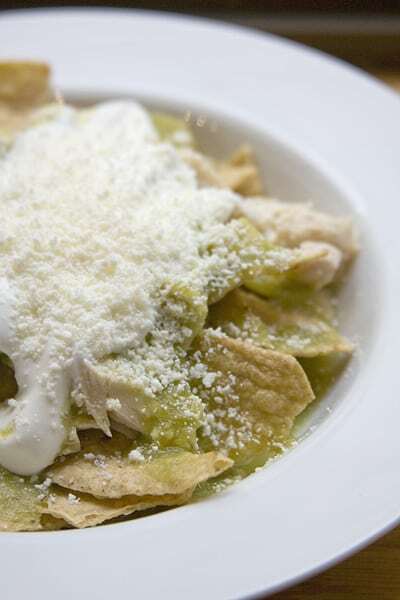 Chilaquiles are a simple yet unmistakably Mexican dish, made with corn tortillas, salsa (green or red) and topped with soured cream and fresh cheese. Other traditional versions are topped with shredded chicken or with a fried egg. 1. Heat a large pan, add 1tbsp oil and 1/4 of the cut tortilla . Cook until golden brown. Place into a medium sized bowl covered with paper towels. Repeat until all tortillas are cooked. 2. Heat the sauce in a casserole. If you’d like to eat your chilaquiles with chicken, then tip the shredded chicken into the casserole. 3. Decide on wether you’d like for your chilaquiles to be soft or crunchy. If you’d like them to be soft, then tip the cut tortilla into the casserole with the chicken, cooking for about 5 to 10 mins, until desired consistency is achieved. If you’d like them to be crunchy, you can tip the tortillas into serving plates and pour the sauce mixture directly on top of the tortilla chips. Add desired garnishes, serve as soon as ready and enjoy! !